If Yahoo Local were a standalone startup, it might look like Center’d. Partly that is because CEO Jennifer Dulski used to be the general manager in charge of Yahoo Local. Center’d, which publicly launches today, is a mixture of an event-planning/invitation site and a highly targeted local search engine, with a little social networking thrown in. The entire site is set up to do two things: plan and explore. You import your email contacts, put in your zip code, and off you go. There is a calendar view for local events, and a map view for local destinations. 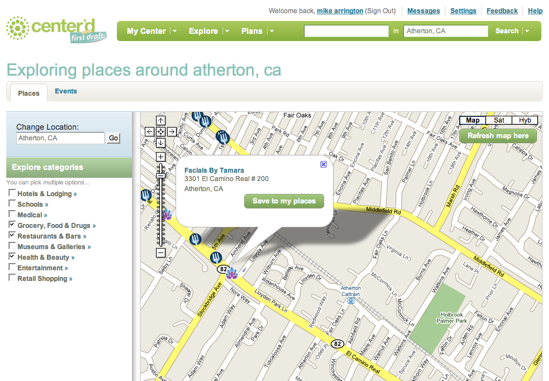 Center’d is both a local search engine and an event-planning application. You can search places for restaurants, hotels, schools, museums, stores, etc., and the results appear on a Google map. There is also a calendar view. Once you connect with friends on the system their events pop up in your searches. And you can also create your own events and get your friends to help decide the details. For instance, things like the location and date can be voted on. Want to have a party by the sea? Ask your invited guests if they’d rather go to Stimson Beach or Montaro Beach, and if next Sunday is better than this Saturday. You can also assign tasks for them to sign up for: bring lobsters, bring wine, bring volleyball. The site is perfectly serviceable and looks like it will do a decent job with both event planning and local search. The interface is heavy on Ajax, with the screen telescoping open as you go through the options. It is very similar to Pingg in that regard, except it is much more limited in what it can do. But Center’d is also not doing anything appreciably different from many other startups on the event-planning side, including Pingg, Socializr, and MyPunchbowl. It does have the local search piece, but so does Yelp, Yahoo, and Google. Still, when you are starting out with FatDoor, anything is an improvement. Since then, the site has been improved. Places can be saved and commented on. And it lets you connect to people through places, such as schools, stores, or museums. Social + local. Isn’t that the original definition of community?